Safety and health training can range from basic awareness through advanced level training. One of the distinct advantages Lancaster Safety offers is our network of highly qualified trainers located throughout the United States. We are constantly partnering with new trainers which means our training offerings are always expanding. Listed below are the most frequently requested specialized training topics. If your company needs training on something that is not listed, please contact us! OSHA’s fall protection standards, what it takes to develop a program, fall hazard recognition, how to protect yourself, elimination/controls methods, applicability of fall protection regulations, the responsibilities of designated persons, detailed inspection of equipment components and systems, fall protection rescue procedures, creating a safe working environment, hands on exercises and inspections. Read more here and message us for a quote today! The results of an arc flash burn are devastating and should be avoided at all costs by thoroughly training your employees and preparing your workplace with the necessary precautions. The deadly temperature of an arc flash can reach as high as 35,000 degrees Fahrenheit! Through proper training with one of our NFPA 70E trainers, we can reduce the chance of an arc flash occurring by using engineering controls, administrative controls and appropriate personal protective equipment (PPE). Our arc flash training will cover what an arc flash is, why they occur, what OSHA requires (OSHA 29 Code of Federal Regulations (CFR) Part 1910 Subpart S), prevention methods, proper labeling according to Section 110.16 of the 2008 National Electrical Code, appropriate tools/equipment and how to calculate for the degree of an arc flash hazard. If your employees are exposed to electrical hazards, contact us today for more information on arc flash training prevention. The AWARE training program was created by West Virginia University and safety professionals in the oil and gas industry through OSHA’s Susan Harwood Training Grant. The training is a basic safety orientation to the hazards in the oil and gas industry covering site preparation, drilling, and production, along with the applicable OSHA Standards. AWARE is an oil and gas specific training that helps attendees to recognize and control health and safety hazards while onsite. Employees are getting injured or killed each year while working in confined spaces and an estimated 60% of the fatalities have been deaths that occur during a rescue. Oftentimes what happens is that an employee attempts to rescue the entrant without the proper training and then gets caught themselves. Proper training can prevent employee injuries and deaths by covering OSHA’s confined space requirements along with ANSI and NFPA guidelines. In this training, we will cover permit vs. non-permit required confined spaces, what hazards are encountered in a confined space, the hazardous conditions that would prevent entry, how to respond to a crisis emergency, what personal protective equipment (PPE) needs to be worn, procedural requirements, responsibilities/roles of team members and thorough training on how to recognize symptoms of overexposure of air contaminants. How and why CPR works, patient assessment for injury/illness, how to provide the basics CPR for both adults and children, proper AED use, the Good Samaritan Law, and how to stay safe while administering CPR. Upon completion of this course, students will receive a course completion card. After completion of this course, the participants will be certified to train forklift operators. Includes refresher training, site specific training, operating hazards, stability triangle, combined actions, pre-operation inspection, nameplates, operating a lift truck, tipping, loading/unloading, traveling, ramps and railroad tracks, docks, parking, unattended fork trucks, and propane refueling. HAZWOPER stands for Hazardous Waste Operations and Emergency Response. Hazardous waste that is toxic, flammable or corrosive can cause fires, explosions and pollution and can be extremely harmful if they are not properly treated and disposed of. Hazardous Waste Operations and Emergency Response requires proper training. Topics include HAZWOPER regulations, safety and health plans, hazardous chemicals, safety hazards, air monitoring, medical surveillance, site control, decontamination, personal protective equipment, and respiratory equipment. The number of required training hours depends greatly on the employees exposure to hazardous waste and their role in potentially cleaning up a spill. Visit our HAZWOPER training guide for more information on training requirements and FAQs. An Industrial Hygienist can come to your workplace to anticipate, recognize, evaluate and control environmental hazards which may cause sickness, impaired health and well-being of your employees. They will test employee exposure, conduct environmental monitoring and use analytical methods to determine what workplace controls can be used to reduce or remove environmental hazards. We can bring an electrical safety consultant right to your workplace who is well versed in the National Fire Protection Association’s safety standards. This training will help employers establish safety guidelines in order to comply with OSHA’s electrical regulations and will cover safe work practices, arc flash, arc blast, PPE, electric shock, electrocution, live work permits and LOTO. Authorized climbers – understands the mechanics and performance of each piece of equipment they are required to use on the job. Competent climbers – have taken an authorized climber course and are now able to recognize fall hazards and take corrective action. Authorized rescuers – participants in the course have completed at least the authorized climbers class. They should be able to develop and maintain climbers who are capable of performing self-rescues and assisting a competent rescuer with preassigned rescuer tasks after course completion. Competent Rescuer – all participants have taken the authorized climber and competent climbers course previously. Upon successful completion of the competent rescuer training course, participants will be able to develop and maintain climbers who are capable of performing rescues. Competent rescuers should physically perform rescues. Excavation and trenching are among the most hazardous construction operations. OSHA defines a competent person is someone who is capable of identifying existing hazards and can foresee preventable hazards. They also have the authorization to take prompt corrective measures to eliminate them.Our competent person training will help your employees become knowledgeable about the applicable standards and help them be able to identify workplace hazards. This training also contains the requirements for excavation and trenching operations. Oil and gas operator companies recognize that the SafeLandUSA training was developed specifically for the oil & gas industry. SafeLandUSA training is the oil and gas industry’s standard training orientation which covers a standardized set of minimum requirement topics which were developed by a volunteer organization comprised of oil and gas professionals. An LSCI representative will spend up to 1 day on site to conduct the Safeland certification course for up to 20 students. 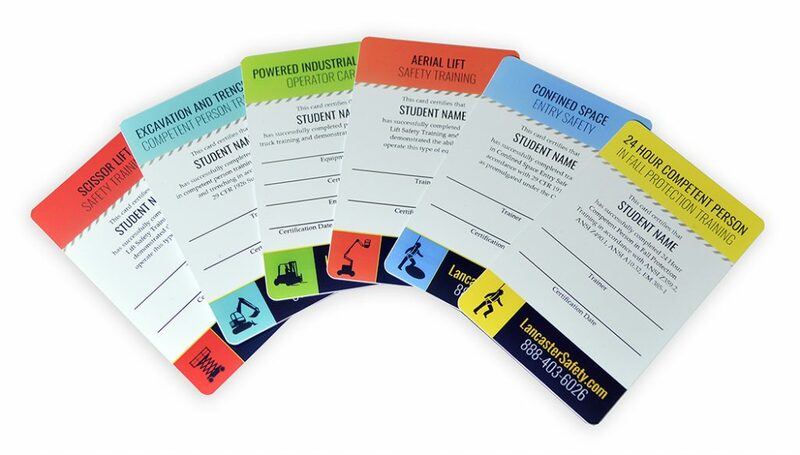 Students will receive wallet sized certification cards for completing the course.Contact us Today for a Quote!